We Have All Heard It – Sitting Is the New Smoking. It is well known that sedentary behaviours such as prolonged sitting increase our risk of chronic diseases such as heart disease, diabetes, obesity and hypertension. Each of these chronic diseases is an ingredient for cardiac arrest. Cardiac arrests can happen any time and any where. The quick and easy availability of a defibrillator at workplaces can be the difference between life and death. Save lives by getting one installed today. But with sitting be such a routine thing in most occupations and workplaces, how do we combat this hazardous behaviour? The answer…. Standing. Let me explain why. Increased levels of “bad” LDL cholesterol. Decreased levels of “good” HDL cholesterol. Increased blood sugar levels and decreased insulin sensitivity. Increased measures of inflammation in our blood. So, if sitting is so bad, maybe a bit more exercise will help. Right? But if sitting all day is bad for us, what can we do to combat it? Well the amount of physical activity required to help combat the physiological changes that occur with prolonged sitting is actually relatively small. In a study published in 2012, researchers showed that just 2 minutes of light or moderate walking every 20 minutes can help improve glucose metabolism and insulin levels. Although 2 minutes of walking seems quite easy, for many people incorporating an extra 48 minutes of walking into their work day poses some challenges. The research on standing desks is relatively limited due to the concept being so new. Standing desks are a great ergonomic solution for any workplace that wants to fulfill their duty of care and provide their employees with a safe and healthy working environment. They allow the user to easily alternate between a standing or a sitting working posture. Having the flexibility to choose to work standing or sitting is ideal for ensuring employees are able to complete their work, and reduce the health risks associated with sitting. To make sure your workers are healthy and safe, partner with Alsco. Alsco is committed to help you create a safer and healthier workplace environment by providing fully-managed first aid kits with regular maintenance and other hassle-free services. There are 2 types of standing desks available – a standing desk convertor or a standing desk. A standing desk convertor helps convert a traditional desk into a standing desk. They sit on top of a desk and help transform it into an adjustable sit to stand workstation. Standing desk convertors are typically cheaper then standing desks and allow you to keep your existing desk. 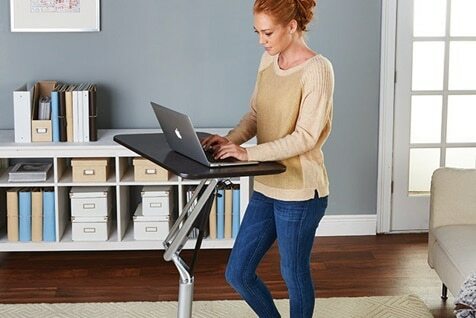 A standing desk on the other hand, replaces your existing desk. They are height adjustable between 700mm to 1100mm and come in either a manual adjustment or electric adjustment. Although more expensive, they offer the benefit of being able to easily adjust the height of your whole desk and everything on it. Standing desk convertors only adjust the height of the equipment that sits on it. Promoting a workplace that allows individuals to stand up more not only offers many health benefits but can also improve workplace culture. Three out of every 4 full time employees of large companies wish they didn’t spend most of their working hours sitting. Consider implementing strategies in your workplace that promote less sitting time and encourage more activity or standing. Create a safe and healthy workplace, contact Alsco to enquire about our cost-effective renting solutions.